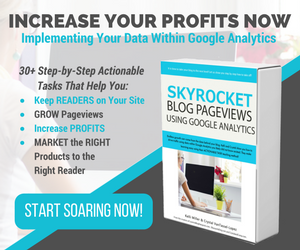 Have you checked your page rank yet? If you are interested in optimizing your search engine results, you may want to do this. Feel free to visit Google’s PageRank Checker to see how your website stacks up! They will provide you with a score of 1 – 10 (10 being best). If you are rating rather low, you may want to make some changes to improve your page rank. Maybe, without you even realizing it, some practices you have currently in place are negatively impacting your page rank. With that said, let’s discuss some things you can do to improve it. Always include your most important key words in your post title. Also remember a post title should not be too long. Anything over a certain amount of characters may be mistaken for spam. A post title should be short, simple, and informative. Does your text include your keywords? If not, it most definitely should! Try to use the same keywords you used in your post title throughout your content including in headers, alt tags for images, and links (within reason of course). Read more about this below where I refer to keyword-rich anchor text links. Create and continue to build backlinks. These are links that point back to your website. A great tool, I’m sure you are familiar with, that creates an automatic link back to your website is Pinterest. Always post unique, relatable, and fresh material if you want to get your content pinned. Interested in a NEW BLOG HOP that provides participants the opportunity to get their content pinned a minimum of 31 times? Check out the details on my blog, Cropped Stories! Other ways to get your link out there is to leave comments especially on websites that use commentluv which is a tool that automatically generates your most current post’s URL. It’s like free advertising so why not take advantage? While we are on the subject of advertising, try sponsoring some websites you frequent. Just make sure they are reputable websites. 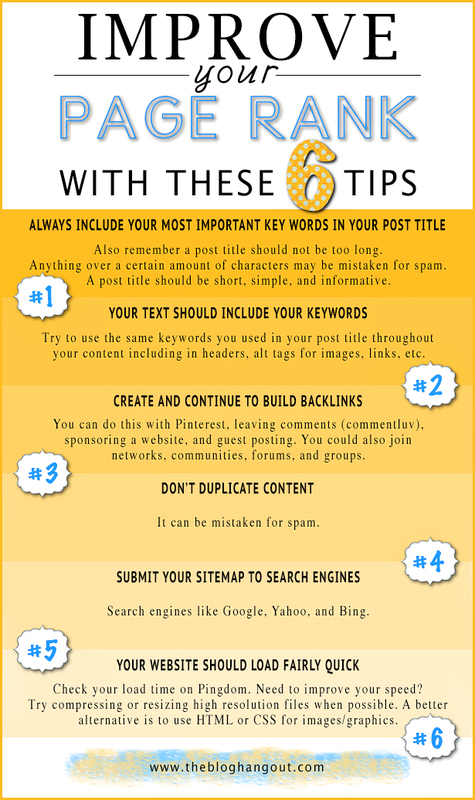 Be certain to publish your posts across social networks (most importantly Google+). Join networks, forums, groups, and communities where you can share your content with people that have similar interests. Lastly, don’t forget to volunteer to guest post! Try not to duplicate content. It can be mistaken for spam. 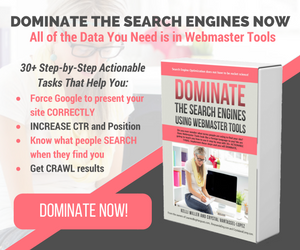 Submit a sitemap to search engines like Google, Yahoo, and Bing! Your website load time should be reasonable, if not FAST! Feel free to check your load time on Pingdom. Need to improve your speed? Try compressing or resizing high resolution and large files when possible. A better alternative is to use HTML or CSS to display your images or graphics instead! Some of these are alarming. The first bullet makes me believe Google may consider a product review, which I’m sure you know is popular among bloggers, a link scheme. Of course if you are the one doing the review, than I’m pretty sure you’re in the clear. I think. And what about “exchanging money for links…”? Have you ever co-hosted a giveaway or blog hop? Essentially you are paying the host to include links in their post that point back to your website. Don’t feel bad, I’m guilty of this myself. I’d love Google to define what they consider “excessive” in bullet 2. The first thing that came to mind when I read “Link to me and I’ll link to you” is button swapping. Are you currently exchanging ads with other bloggers? I know I am. The third bullet refers to “guest posting campaigns with keyword-rich anchor text links”. So let me break that down for you. The term keyword-rich just refers to the over or excessive use of keywords and anchor text links are the actual clickable text that, when clicked on, takes you to a new source (website). In layman’s terms, I take that to mean don’t be obnoxious. When guest blogging, limit the number of links you provide and make sure your anchor text (clickable text) for your links don’t contain the same keywords. The link to text ratio, according to About.com, is one link for every 125 words. All food for thought I guess. Blogging Crash Course: Are you spamming your own blog? What to do about Google’s comment spam policy! Comments, depending on what type of comments they are, can negatively affect your Google rank! Once I read it, I just knew I had to share it. To me, it should have spread like wild flowers (that’s how important I felt it was). I highly recommend reading this and passing it along. Help protect your fellow bloggers! We have to look out for one another. And a BIG thanks to all the bloggers that posted on this topic! If you missed our previous post, Introducing Coull Vidlinkr – Generate Revenue from Video, we hope you’ll check it out! Also, feel free to hop on over to my personal website: Cropped Stories to enter for a chance to win a $200 Amazon Gift Card and a box of 6 Woolzies! Okay, I guess I should really let you go. I hope, at the very least, you learned something new from this post but if I helped you improve your page rank too then GO ME! Thanks for posting this. I’ve learned a lot from this post alone. I’m a new subscriber now too. I will look forward to more. It’s very useful information, but I have a little question, is there any difference between submitting sitemap and not-submitting sitemap to search engine? will there be any effect on how my website / blog will perform on search engine ? Thank you so much for sharing such a great article with us. 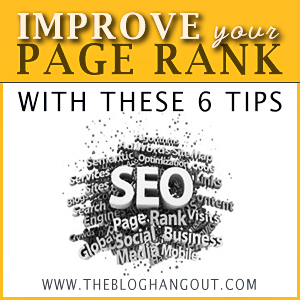 I am very sure that all these tips will help me to improve page rank for my website. So glad I came across this site. There is an abundance of info here and I’m hoping to get my PR up from a -0-. I will take all the above into consideration when doing my next post. Thanks for the informative article. Thanks for the useful tips. After almost a year I created my website. My PR is still ZERO, while I’m seeing my competitors have PR 2 even though my site are better in the following: more quality postings, more site linkings and older. It’s very frustrating because hard working did not get good reward. I’ll try to follow your tips from now on to see if my site will be improved. Thanks again for sharing. Great article it will help me to increase Google Page Rank for my blog . thanks a lot. Thanks for all the tips and being so quick with them. It is hard to keep on top of everything new coming out so this type of post is really helpful when it comes to SEO and my own blogs! Great post! Thanks for the tips..I learned bunch from this. Thanks for the tips! We are already up to Page Rank 4 with our site. Hopefully after implementing more of your suggestions, we will get even higher. Thanks for the info! I’m trying to figure out why my blog and website are so low! I just ran the PR checker and my blog is 1/10 and my website is 2/10! Would love some input…as I’m pretty sure I’m already following the recommendations on how to boost my ranking. I KNOW I need to try to get more comments on my blog as those seem to be lacking. Anyone care to take a look and give me some ideas? try writing more posts with good content that you have seo’d. The more google can add to you as an author the more they see you as an authority in your niche. Make sure you have G+ setup and have claimed your authorship. Thank you very much for the valuable information. I had been struggling to get good rank in Google. I’ve always heard that blog commenting is the most fruitful SEO technique working these days however what I’d like to add here is that it is recommended to keep a track of what keywords you are using for commenting in order to build your link juice and also advisable that instead of posting comments to a few sites, spread your keywords on as many sites as you can. Variation in keyword should also be practiced so as to keep a balance of your keywords density. My page rank will forever be 2. And I just don’t know what else to do. I do everything you mentioned. Thanx a lot for sharing valuable tips for us. i am new on blogger. What a great post! I appreciate the pointers! Good stuff here! I’ve tried and tried, but I’m still unranked. 🙁 I’ll definitely do what you suggested! Thanks so much for your help! I’ve tried SO many things and I’m still UNRANKED 🙁 I’ll definitely do what you suggest! Thanks! How goes it, well put together site you’ve presently. Great advice! I didn’t know that blog titles should be too long or it’ll be flagged by google. I’ve used some pretty long titles! Stopping by from the Sharfest! I feel invisible, Google doesn’t have a page rank for me. 🙁 I’m working on backlinks all the time but need to do better with key words. Thanks for the tips and linking up with My Favorite Posts Show Off Weekend Blog Party. I’m working on submitting my site to Google but have a problem with step #3 about adding a meta tag. Where is the radio button? I found this post through the Sharefest and you are brilliant! I knew about the keywords but didn’t realize the significance of the backlinks. Thank you for this post! I’m always looking to better my page rank, especially since I just switched to self-hosted so I’m trying to build the page rank for the new site. Oh, I’m so glad you found us too! Yes, backlinks are extremely important :o) I’m glad I could be of help! Hope you are having a wonderful weekend! Don’t mention it Kathy; I’m just glad to help out :o) Hope you have a great weekend and thanks so much for stopping by! As always, thanks for some very useful and simple to follow tips! Wonderful ideas, thanks for all your help. I am planning on participating in your Fantastic Blog Hop. What a cool idea! p.s. I love the pictures in your blog header, super cute! Thanks Mollie for stopping by and I hope my post was helpful! I’m so happy to hear you’ll be linking up with us on 9/3; we are all super excited about it! I look forward to seeing what you’ll have to share :o) Happy Friday and have a great weekend! Don’t even mention it Joyce; just so glad I could help out :o) Thanks a bunch for stopping by and I hope you’re having a great day!